Welcome to the desolate wastes readers, noting around for as far as the eye can see. This is the land time forgot. A land of metal, poorly sculpted faces, and quite possibly the only codex to make Tyranids say "I'm sorry you're so bad." Yes, this is the badlands of the Sisters of Battle Adepta Sororitas. Sorry, gotta keep up on those names we can actually protect! Maybe if we make some friends though, things wouldn't be so... horribly barren out here. Can anyone help us out? To answer that question, we need to answer this one first: What do we need to make our way to greener pastures? Well, given that the sisters love their melta and flamer weapons, both of which are short ranged and hard to equip a flyer with; long range and flyer support are both on the list. Otherwise, our sisters aren't the cheapest, so there's that to consider as well. Bonus points if the allied models are nice plastic. Anything to counterbalance all that metal our primary detachment has to carry around. Fluffiness will also be considered in our appraisal, but might take a back seat to quality of models or strength of support. Up first are the sons of Sanguinius, the Blood Angels. The immediate big draw here will be twofold. First, taking lots of models with meltaguns and flinging them at the enemy's face. The second will be one of the nicer plastic space marine ranges. 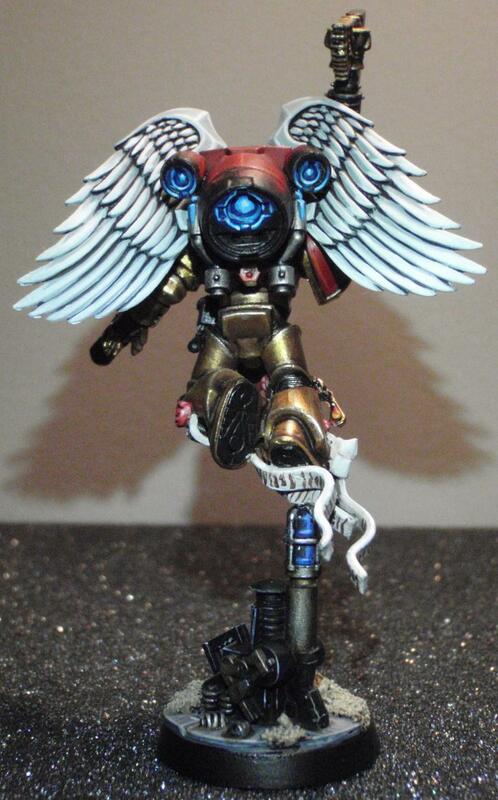 Seraphim are pretty solid for Sisters, and supplementing them with Sanguinary guard makes for some nice visual appeal, regardless of how good the guard themselves are. 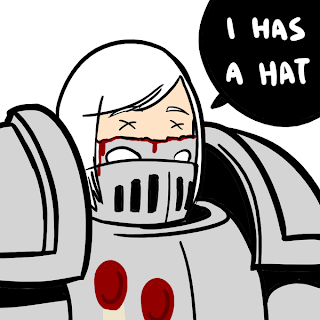 On the whole though, Blood Angels aren't our best option. They're too expensive (points totals) and, though this strategy isn't inherently bad, they do force us to commit even harder to going all in, which is problematic in 6th. It's not impossible to win with it, but it is immensely more challenging. 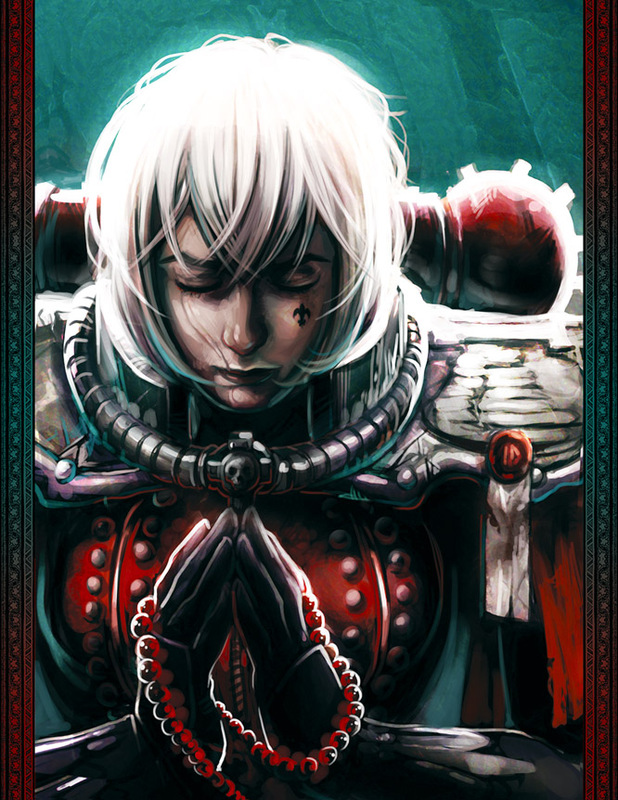 Don't be afraid to consider Blood Angel allies, but know that it won't make your games less challenging. Venturing onward brings us to the Rock, home of the Dark Angels. For the glory of the Imperium, they complete the holy trinity of weapons (flamer, melta, plasma), but otherwise, they're not willing to lend out their first or second company to hold down objectives, nor are their tactical marines possessed of exceptional special rules. Certainly there's the ability to get something going here with robes and tabards and create a "monastery" army of nuns and monks, but outside of that possibility, maybe look elsewhere for friends. The rad grenades launchers don't do much when we're already packing melta, and that's the biggest draw of these guys. If we want to get inquisitorial, there's the Grey Knights. Hopefully, if we're the primary, they won't stab us and wear our blood for the sake of purity. The biggest issue with looking at these guys is that they're not cheap. Or long ranged. By any stretch of the imagination. That said, they offer the fluffiness of "We hate your psykers" which can be pretty cool. Coteaz can help make the cheap troops work out, but at the end of the day, there's easier or better ways to work him into a list. Such as an Inquisitorial detachment. You'll lose the ability to bring a Psyfleman, Stormraven, or Dreadknight, but you'll leave your allies open for something more exciting. 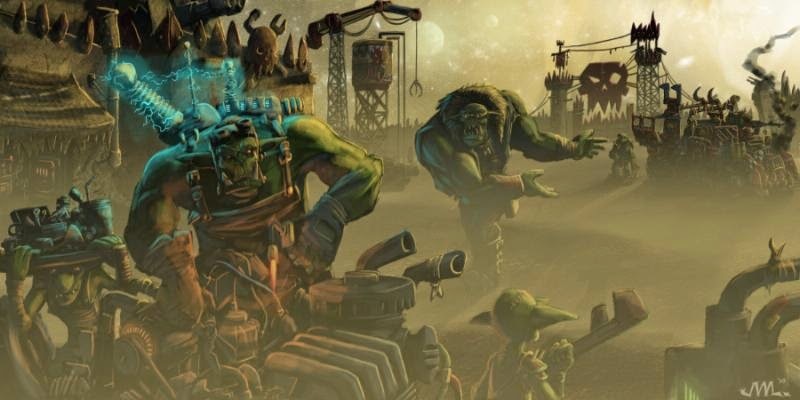 On the inquisition subject, bringing along a cheap inquisitor, even without it being Coteaz with henchmen, is something we should consider if we want to bring some fun, fluffy and functional allies from the Space Marine codex. It'll require a trip to Forgeworld, but depending on your play group, that's not a problem in the slightest. Outside of those Marines I've asked you to hold out for, we've come to the most appealing ally by far in my opinion: the Guard. Yes, the cheap little buggers bring lascannons and Leeman Russ chassis, as well as artillery platforms. The ability to reach out and touch someone at range, the durability of front 14, and a swarm of expendable dudesmen in the form of the platoon all help cure what ails us. At the end of the day though, these guys aren't going to solve any monetary gripes that Sisters raise, as the volume of models required can quickly get out of hand if you're writing for potency. Not just that, but they don't entirely solve durability issues, as you'll be putting strictly T3 models on the table. There's a mess of them, but the issue still stands. 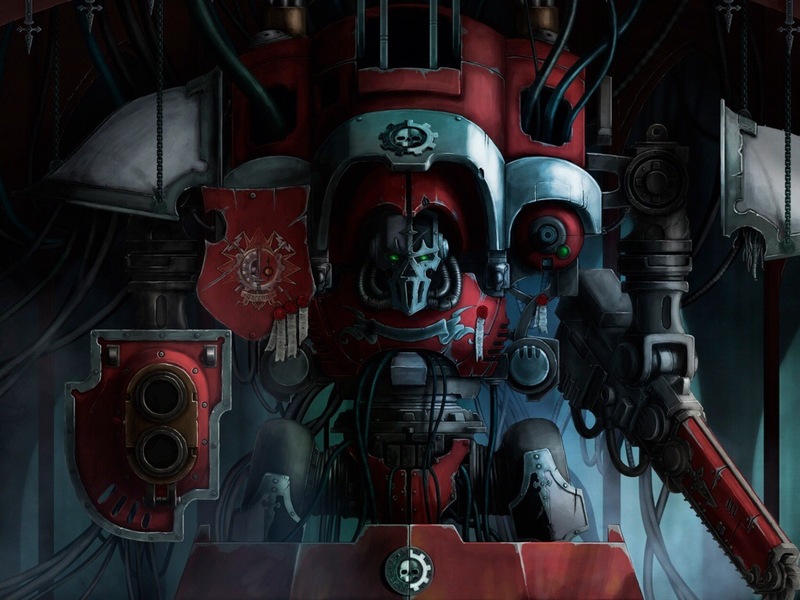 Our next option is fairly complex to consider: the Imperial Knight. Bringing along 1-3 as an ally means that they won't be scoring, but it's hard to argue with the firepower that even one is capable of. And that leaves me very deeply torn as to suggesting one. They're not invincible, and an average list can knock one down in about two shooting phases. One is useful, but can be tricky, two are easier to use but will often beg the question as to why we're sinking half to a third of our army into two models without going for broke and playing a three knight primary. Quite the conundrum, but at the very least I won't say that a single knight isn't worth at least considering. Remember those Space Marines I told you to stay tuned for? The Red Hunters. They've got a suite of special rules I'll leave you to go snag off the FW site, but I think you'll agree, even if the fluff wasn't enough to draw you in, the rules will. The marines offer your sisters a "buffer" for both the front and back lines by delivering T4 troops, and devastators alike. Flyer support? You got it. The Stormtalon is a winner. Right price, right shots. Sure, you'll have to requisition them by Inquisitorial edict, but that's not a big problem, especially if that inquisitor just blesses the Devs. Last, we find the Space Wolves. These guys shake out about the same as the marines, but without the tasty fluffiness or Stormtalon. That said, they offer a much improved CC punch, which is valuable in and of its self, considering that our T3 selves hate CC. Likewise, if one was out to recreate 30k era wolves and the burning of Prospero, Sisters aren't unfluffy in that regard. On the whole though, I'd put these guys in third place, firmly behind the guard and Red Hunters. And there we have it, a breakdown of all the armies the Sisters will consider bringing along to solve their problems, not the least of which are expensive metal models. This isn't to say that you have to bring allies, but rather to suggest options which would allow you to come into the wonderful plastic future we're living in right now. Being both a sisters player, and a Templar player...I've had great success combining the two forces. I use the templars to handle the chopping, and the sisters to handle the shooting. The two synergize nicely together. I had one opponent call the combination "overpowered". As handling that many exorcists, seraphim, immolators, and then ironclads, stormravens, stormtalons, and crusaders gave them fits! The reason they weren't listed in this breakdown is that they're desperate allies. The series was designed to explore brothers and convenience allies. Desperate is just that much of a deal-breaker. You are sadly correct. We kinda of ignore that locally since they fight side by side in the books. (and in the 40k rulebook fluffs). Hoping they fix that in the revamp of 6.5 edition. Interesting that ignoring certain rules has led to overpowered instances. Nevertheless, I'll completely agree that the allies matrix needs a rework, not the least of which begins with removing battle brothers. Past that, the Tau and Grey Knight matrices are the most serious offenders. Agree. In fairness, generally when I play sisters and templars, the templars are held in reserve, and handle engagements away from the sisters themselves. So the desperate allies check never really comes into play. (Play a little fluffy that the templars are fighting in orbit, and the sisters have to hold the line before they can come and help). I imagine if you could join a priest to a templar crusader squad...it would be a bit "fun" and overpowered :). If your Templar have ever controlled an objective, desperate allies would have come into play. And from the sounds of it, with guard, (wording notwithstanding) you might be able to do just that.